Back Loop Single Crochet Otherwise Known as "Ribbed Crochet," "Crocheted Ribbing," or "Crocheted Rib.". Photo © 2010 Amy Solovay, Licensed to About.com, Inc.
"Back loop single crochet" is a variation of single crochet stitch. As the name suggests, you achieve this look by working your single crochets through the back loops only. Crocheters have used various other names to describe this stitch. Many people refer to it as "rib" or "ribbing." According to The Dictionary of Needlework, this stitch is also known as "ribbed stitch" and "Russian stitch." Knitted ribbing is familiar because it's often used at the sleeves, necklines and edges of sweaters, but ribbing need not always be knit. Crochet work can mimic the look and feel of knitted ribbing as well. 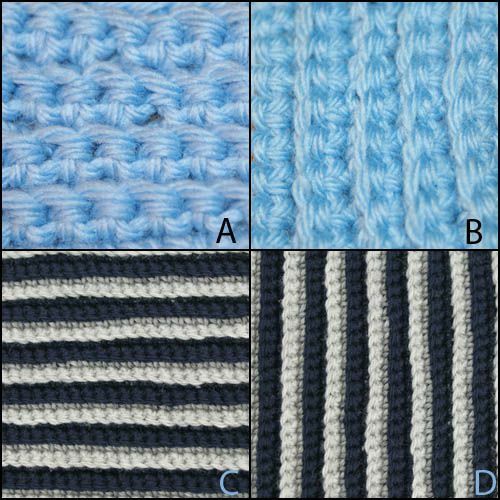 There are many different possible ways to make ribbed crochet. Back loop single crochet, as shown here, is one of the simplest ways to make crocheted ribbing. View A - Solid Back Loop Single Crochet: This swatch was worked in Cascade 200 wool yarn in Robin's Egg Blue. To work a sample like this one, start with a foundation chain of any number of stitches. Single crochet in the second chain from your hook, and in every chain afterwards across the row. At the end of the row, work a turning chain and turn. For the second row of single crochet stitches, work only in the back loops. Work one single crochet in each single crochet stitch across the row. Repeat the second row as many times as you need to, always working in the back loops only. View B: This photo shows the same swatch, flipped on its side. When you flip it like this, it looks and performs a bit more like ribbed knitting, with the stretch going in the same direction that you'd expect from a knitted rib. View D: This photo shows how the striped fabric looks when it is flipped on its side. In the team spirit hat pattern, ​the crochet work is flipped like this to make the best use of the fabric's stretchiness. There are so many more possibilities for using back loop single crochet. You can play with creating many different stripes, color combinations, and colorwork patterns. Striped Ribbed Single Crochet Stitch in Cascade 220 Navy Blue and Silver Heather Wool Yarn. Photo © 2010 Amy Solovay, Licensed to About.com, Inc.
To work a sample like this one, you'll need two colors of yarn: color A and color B. I used Cascade 220 wool yarn in navy and silver heather. You can use any colors or fibers you like. Using color A, start with a foundation chain of any number of stitches. Row 1: Single crochet in the second chain from your hook, and in every chain stitch across the row. Work a turning chain and turn the work. Row 2: Work one single crochet stitch in the back loop of each single crochet, all the way across the row. When you get to the last stitch in the row, insert your hook as usual and draw up a loop. Then switch to color B by drawing through a loop of color B to complete the stitch. When you do this, make sure to leave a long tail of color B for weaving in later. Evaluate whether you want to carry your yarn up the sides of your work. You can do so from this point on; just drop the unused yarn and pick it up again later when you need it next. Then work a turning chain and turn. Row 3: Work the entire row in single crochet, again working only in the back loops. Row 4: Work another row of single crochet in color B, continuing to work only in the back loops. When you get to the last single crochet stitch in the row, switch back to color A. Continue alternating between working two rows of color A and two rows of color B. This type of striped design is used in my team spirit hat pattern. In my team spirit hat, this stitch is worked in a rectangle, which is then used to form a tube. If you want to make a tube using this stitch, the instructions are slightly different. To work a sample like this one, you'll need two colors of yarn: color A and color B. I used wool yarn in purple and yellow. You can use any colors or fibers you like. Row 1: Continue working in color A. Single crochet in the second chain from your hook, and in every chain stitch across the row. When you get to the last stitch in the row, insert your hook as usual and draw up a loop. Then switch to color B by drawing through a loop of color B to complete the stitch. When you do this, make sure to leave a long tail of color B for weaving in later. Evaluate whether you'd like to carry your yarn up the sides of your work. If so, you can just drop the unused yarn and pick it up again later when you need it next. Row 2: Work a turning chain and turn the work. Using color B, work one single crochet stitch in the back loop of each single crochet, all the way across the row. Row 3: Continue using color B. Work a turning chain and turn. Work the entire row in single crochet, again working only in the back loops. At the end of the row, change back to color A. Row 4: Work a turning chain and turn. Work another row of single crochet in color A, continuing to work only in the back loops. Row 5: Work a turning chain and turn. Work another row of single crochet in color A, continuing to work only in the back loops. When you get to the last single crochet stitch in the row, switch back to color B. Continue alternating between the two colors. Final Row:When your project is the desired size, end with a single row of Color A. Then you can stitch the first row to the last row using ​slip stitch as shown above. In my sample photo, I'm crocheting the slip stitch in white so you can see it, but when you do this you'd want to use color A, so the join won't be obvious. When my Aunt Nancy taught me how to crochet, one of the first questions I asked her was whether I should crochet through both loops or just one. "Doesn't matter," she replied, "you can do it either way. Just make sure to do it the same way consistently throughout a project." She then went on to explain that you could get noticeably different results depending on which loop you use. Practice and experimentation have confirmed what she told me.